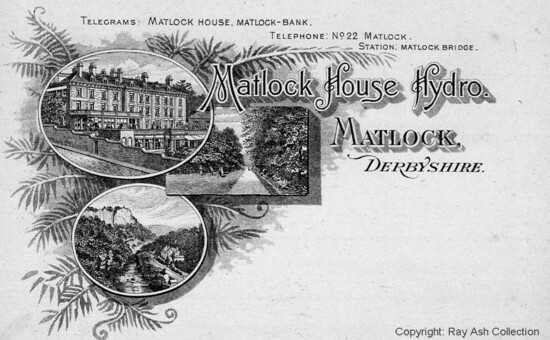 Above is a promotional post card for Matlock House Hydro; it is unposted but has an an undivided back and no message strip on the front, so is most probably early Edwardian. The figures, though tiny, would also seem to support a pre Great War date. The second picture, with the tram going past up Rutland Street, appeared on the front cover of Abel Heywood's 1903 Guide as part of an advertisement for the hydro. 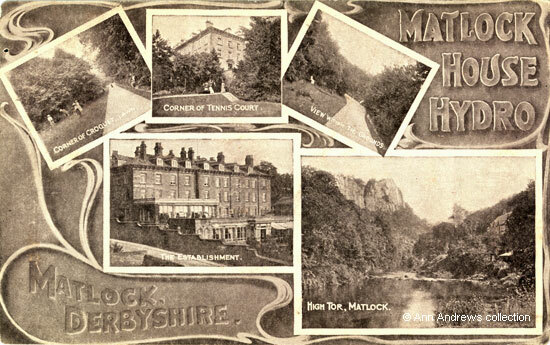 The advert went on to say that the hydro was "the most pleasant situate and most efficiently equipped Hydro in Matlock. For comfort and cuisine unexcelled. Terms, en pension, moderate and inclusive". Robert Hall was the secretary and managing director of Matlock House Hydropathic Co. Limited at the time and four years before the establishment had been described as a "first class health & pleasure resort; hydropathic baths; skilled attendants; liberal table; moderate charges". Twenty years before that, Charles Rowland, his wife and some of their relatives had run the hydro. Of similar date to the top image. Three of the images are identical to those on the top card. 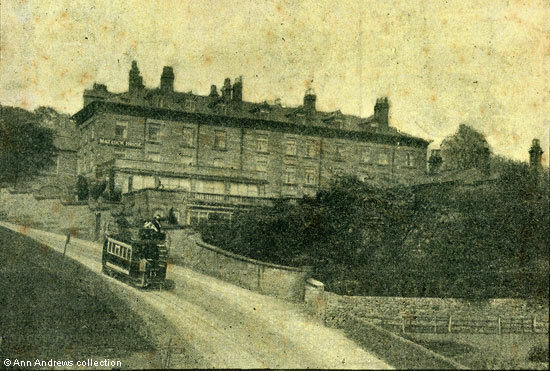 The fortunes of Matlock House Hydropathic company declined and, at two Extraordinary General Meetings of Members held at the hydro on 20 Dec 1909 and on 14 Jan 1910, it was decided to wind up the company. In 1911 The Times announced the death of William Moxon, who had been physician to the "Matlock House Sanatorium". Matlock House did, however, still continue to operate an an Hydropathic Establishment and William Tilley was its proprietor in1917. In 1921 a Private Company, Matlock House Ltd., was formed to "take over the business of proprietor of medical institutions carried on by F. Kincaid at Matlock House. Matlock. The first directors are:â€”Dr. F. Kincaid, Tansley Wood, Matlock, Derbyshire ; J. T. Robertson, 5 Park Lane, Sheffield. Registered Office, Matlock Bank road, Matlock, Derbyshire". A sale notice was published in 1923 and in early 1925 the "London Gazette" announced that "the following companies have been struck off the register and the companies dissolved: Matlock House, Limited, Matlock Sanatorium, Limited". There is a somewhat confusing piece in Ward Lock's 1926 Guide: "Matlock House, the site of which is a little higher than Smedley's, being about 700 feet above sea level, is a fine erection of white stone, sheltered by woods and hills on the north and east. Having been a hydro, it was recently converted to a sanatorium". Either the guide was rather behind the times with the events, or it was a misprint and the word "sanatorium" should have been "school". On 11 March 1926 Mrs. Law opened Matlock Modern School on the premises and the school was there until just before the Second World War. The building was renamed Rutland Court. 1. Promotional postcard in the collection of, provided by and © Ray Ash. Not posted and no obvious publisher. 2. Advertisement from "Abel Heywood's Guide Books ... " (see notes below) © Ann Andrews collection. 3. "Matlock House Hydro, Matlock, Derbyshire". No publisher. Not used. © Ann Andrews collection. Research by and © Ann Andrews. "Abel Heywood's Guide Books, With Cycling, Walking and Driving Routes. Matlock Illustrated." (1903) Abel Heywood & Son, Manchester & London. "The London Gazette", 21 January 1910. Walter Frederick Dakin of "Clovelly" Matlock Bank Incorporated Accountant was appointed Liquidator. Jno McLaren Secretary. "The Times", Thursday, Jul 20, 1911. Obituary for Dr. William Moxon. Moxon also worked for Matlock Urban District Council. See Kelly's Directory Officials 1908. Kelly's Directory 1916 - also see Kelly's Directory 1908 | Kelly's Directory 1912 (when John McLaren was the secretary). He advertised in the "Western Mail", 13 August 1917 and other papers. "Sheffield Independent", 31 March 1921 recorded that on 13 March that year the private company Matlock House, Ltd. was set up with capital of £100 in 1s. shares (1,000 Preferred and 1,000 Founders'). "Yorkshire Post and Leeds Intelligencer", 1 September 1923. "Nottingham Evening Post", 11 February 1925. Goodwyn, Colin (1998) "The History of Tor Cottage Matlock Dale", a privately published limited edition. Mrs. Law also used Tor House, then known as Matlock Garden School. The 1939 Register shows the Law family, including their daughter Jeanne, living in Allenton. Mrs. Law was not working.